Newly added to Blue Creek Cabins, this beautifully crafted cabin has all the privacy and amenities you need for an unforgettable getaway. Bring your entire family, including the four legged loved ones, or enjoy a romantic getaway for just the two of you! 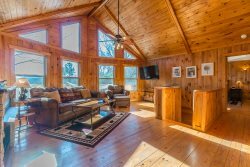 Only few miles from Helen Georgia, yet strategically located so you can easily reach other popular destinations like Tallulah Gorge State Park, Dahlonega, etc. Do you enjoy trout fishing? A short walk will take you to out stocked trout pond and rushing Blue Creek. Do you just want to relax? Soak in the hot tub located on the screened in porch or sit around the fire pit. Inside, you can enjoy a large walk in shower for two or the large Jacuzzi spa bath. Enjoy the fire place during the cooler months or simply watch the deer crossing by. Speckled Trout offers guaranteed peace and quiet. There is a maintained gravel road leading to the cabin. The maximum number of vehicles in the driveway is 3. Great cabins, Easy to work with. Awesome cabin, My wife and family enjoyed our cabin.